80 cm of ds, a photo by ninettacaruso on Flickr. 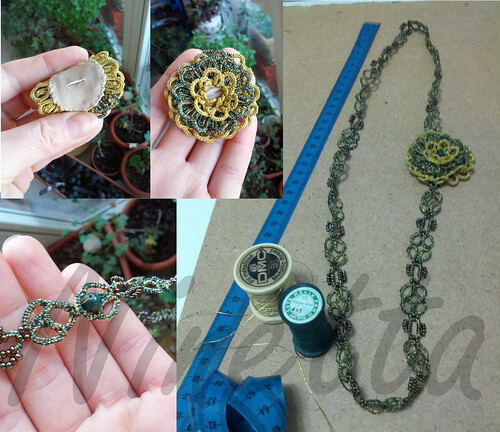 That necklace is worked with 2 shuttles, filled with two threads, green (and yellow, for the flower) 100% pure silk (seta Faro) and DMC n.282 gold metallic thread. Beads were stringed in both shuttles. The necklace's lock is a "button and loop" style fastening, with a little faceted green agate, that it's used to lock the flower, too. The flower is removable, and it could be used on another button as well. On the back of the flower I sewed a rounded piece of imitation leather, leaving a little bottom hole. In that way, the flower could be used on another garment. Questa collana è stata fatta con 2 navette, riempite con 2 filati, quello verde (e il giallo del fiore) è di pura seta, marca FARO, l'altro è il filo metallizzato oro della DMC, n.282. Le perline le ho inserite direttamente nel filo delle navette. La chiusura a bottoncino ha una piccola agata sfaccettata, che serve anche come centro del fiore. Per il fiore ho cucito un pezzettino di finta pelle sul retro, con un'asola per la pietra. Il fiore si può levare e abbottonare anche su un altro capo d'abbigliamento. That's so pretty. Versatile too, and made from sumptuous materials, it must be a winner! Bellisima, molto originale ed elegante!